Before I talk about news or this week's comic, I have some important points to discuss. 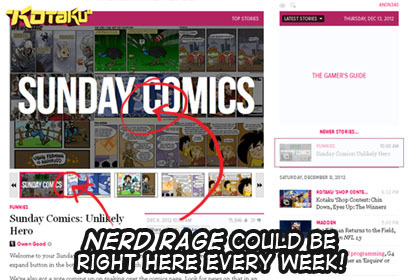 Kotaku is voting for their Sunday comics again. So head on over to Kotaku and vote! Last time around my buddy Javis Ray from Legacy Control got voted in. This time the votes are for all 10 slots. It could be 10 all-new comics! Only your votes can decide, but mostly my point is you should go vote for Nerd Rage. We now return to your regularly schedules update. Hasbro has a new version of the Furby out this holiday season. There was talk of this being the hot toy for 2012, but I don't think it's selling as well as some Hasbro-marketing-executive-who-said-that had hoped. The concept is basically the same as the original Furby (or 'Emoto-tronic Furby', the intermediate form no one remembers) -- it approximates a living animal through a kinda-stuffed, animatronic critter that talks a lot and has a hand full of sensors. He rocks around, lets you pet him, feed him, pull his tail. A new mobile app lets you flick food into Furby's mouth in a way only the guys behind every computer on NCIS could design. In addition to a new batch of sensors, though, the new Furby boasts glowing led eyes that are more expressive soul-devouringly terrifying. He also has a handful of personalities he changes to dependant on how you're interacting with him. How neat, right? He subtly changes over time based on your interactions? Nope. He spasms out, eyes flash and he wakes up someone else. Furby can suffer personality-altering brain damage due to medical negligence! I was searching reviews to see if Furby would live up to the 'hot toy' expectations and really did find a lot of moms giving him negative reviews citing him as annoying. Mostly that he burps and farts and never shuts up. But a negative mom review with burping and farting sounds a lot like the kind of positive review a 10 year old and/or Elliott would give. I generally avoid 'animated' comics. My thoughts are that if I'm making a comic, it better be as enjoyable on a piece of paper as it is on a computer screen. But I really wanted to have Furby's eyes strobe. Even though I made an animated version, I've decided against uploading it. I didn't want to do a comic that could potentially be harmful to those with epilepsy. Kris Straub from ChainsawSuit is truly fighting the good fight. This write up from him about theft and plagiarism of comic art (and rehosting in general) is worth a read. And I mean on his site, not rehosted on imgur and complained about on Reddit with the URL stripped off.